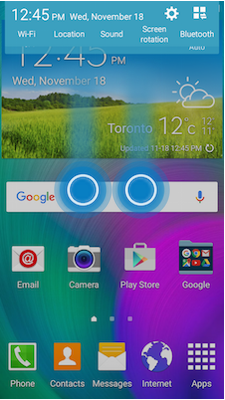 Galaxy A5: How do I use Flight Mode on my Samsung Galaxy A5? 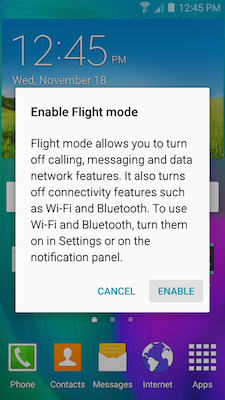 Flight mode allows you to turn off calling, messaging and data network features. It also turns off connectivity features such as Wi-Fi and Bluetooth. 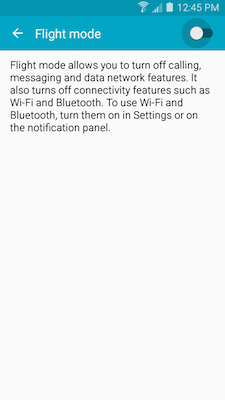 To use Wi-Fi and Bluetooth, turn them on in Settings or on the Notifications Panel. 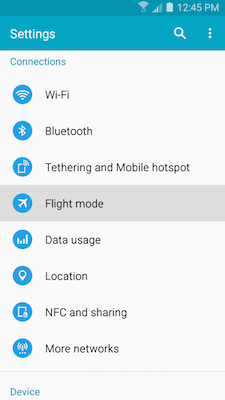 There are three ways to access Flight mode. 3. Touch Flight mode under the Connections tab. 2. Touch the slider to turn Flight mode on . 1. Open the Quick Panel by using two fingers slightly separated to swipe down from the top of the screen. 2. Touch the Flight mode Quick Panel shortcut to turn it on . 1. Press and hold the Power key for two seconds. The Device options menu will appear. 2. 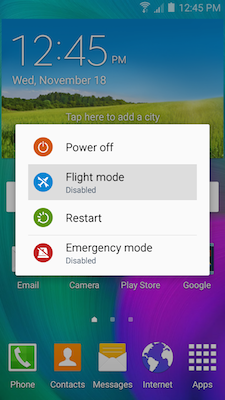 Touch Flight mode to Enable or Disable. 4. 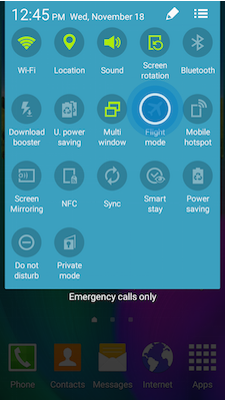 Flight mode is displayed at the top right corner of your screen when your device is in Flight mode. 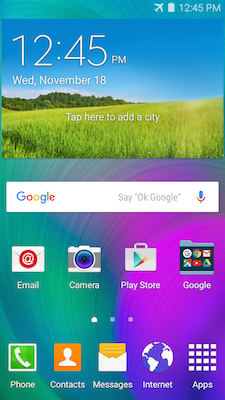 Galaxy A5: How can I change the font size and style on my Samsung Galaxy A5?